It’s hard to believe that Lavera Faces has been around for over 12 years, it just goes to show that when brands launch products that work they’ll run and run. Lavera put a huge amount of research into every single product they launch and are constantly striving to refine and improve their formulations. For the Lavera faces range that means that 2012 is the year the entire range gets a complete makeover and the results are stunning. Fresh and up to the minute packaging that clearly communicates what the product is supposed to do, and the ingredients that make it so effective, as well as the products organic credentials which are very high. 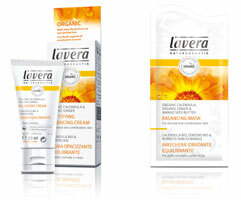 The entire Lavera faces range is certified organic by Natrue and is also suitable for Vegans too. Gentle, for dry, sensitive and mature skins, and the Purifying-invigorating line for Oily and Combination types. Normal skin types (lucky devils!) can pick and choose whichever they like. The cleansers remove make up brilliantly, but Lavera does also make an eye make up remover should you need it for extra stubborn mascara. The toners are refreshing without stripping and the Lavera faces scrub offers gentle effective exfoliation without a hint of scratchiness. The next stage of skincare more closely matches the Lavera faces range skin types we have grown to love so well, but the formulations have been enhanced and brought right up to date for skincare that really feels like a treat for the skin. Dry skin is nurtured by the Wild Rose range, it suits mature skins too, but these are now brilliantly catered for by the Lavera My Age line. Normal to combination skin should choose the calendula range, which now boasts a new addition in the form of a special mask for combination skin, as well as an enhanced formula for the much loved Lavera Faces balancing cream. The products for Oily skin are a vast improvement with a much more sophisticated formula for the moisturiser which helps to mattify the complexion but also features hyaluronic acid to give hydration without greasiness. 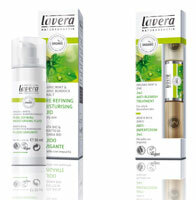 The jewel in the crown however, has to be the Lavera Faces 2 in 1 Anti Blemish treatment. Previously just a lipstick style medication concealer stick that was hard to blend and felt heavy, it now incorporates two brilliant treatments in a handbag handy product. An organic serum packed with ingredients specially chosen to purify the skin and aid healing in a clever little roller ball that applies the product just where it’s needed. At the other end is a soft and creamy concealer in a neutral shade that’s easy to dot into position with a wand to be blended to perfection with a (clean!) finger. I’m really delighted to see such a fabulous revamp of a much loved range and hope you’ll love it as much as I do. If you feel like giving it a try why wait? UK delivery is Free so why not order some Lavera Faces Skincare and see for yourself?